Description: The default settings in Filezilla can corrupt files that are not plain text, like images. This article explains how to set Filezilla to prevent this. Many times, users need to transfer the contents of their /files folder, which contains the post attachments. This may be just to make a backup, or in the course of transferring your board to a new host. There is a potential danger involved in doing this. For the long version, go to THIS BLOG ENTRY. But here is the short version. 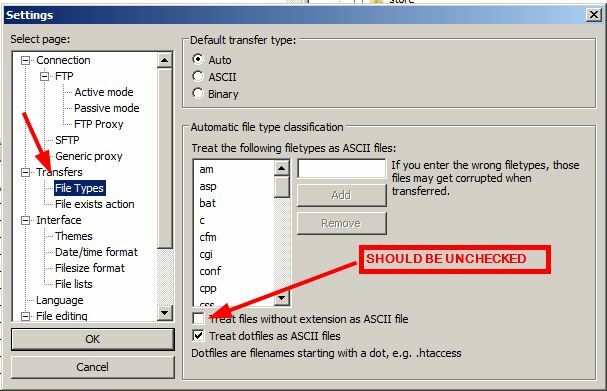 Before transferring any files with Filezilla, go to Edit > Settings > Transfers > File Types and UNCHECK the box next to "Treat files without extension as ASCII file."